No matter what side you believe on whether or not alcohol is safe for unborn babies, New York City just mandated that any pregnant woman can fulfill her cravings -- even if it's for a Bloody Mary. Two days before Mother’s Day, the New York City Commission on Human Rights issued new guidelines to protect pregnant residents, largely aimed at protecting rights in the workplace and in housing. But one of the guidelines targets NYC bars and restaurants. The city guidelines state that bars are not allowed to deny a drink to a person simply because they are pregnant, nor can they be denied entry to a club or bar on that basis. The latter is the topic of an ongoing case, according to the Associated Press. That’s not to say that Mayor Bill de Blasio’s office -- which gets something of a “Thanks, Obama” treatment in New York -- is encouraging drinking while pregnant, but rather it's taking a stand on individual rights. Basically, if a pregnant woman wants a drink, the bar has to comply. 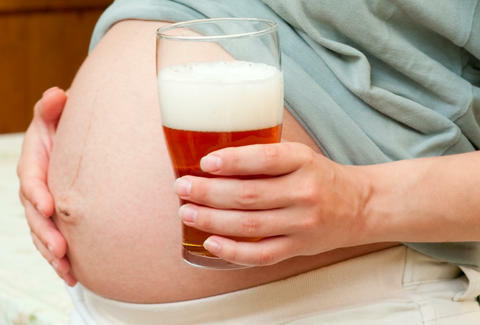 New York City bars are already required to post signs that state “Drinking Alcoholic Beverages During Pregnancy Can Cause Birth Defects,” but that small amount of education will be the limit. “While covered entities may attempt to justify certain categorical exclusions based on maternal or fetal safety, using safety as a pretext for discrimination or as a way to reinforce traditional gender norms or stereotypes is unlawful,” the guidelines state. Although the law requires bars to serve expectant moms, it won't necessarily stop patrons or servers from judging. "In general, a lot of people are paying attention to whether you're drinking or not drinking,” Carlota Fluxa, who just gave birth to her first child, told the Associated Press. She would occasionally have a glass of wine with dinner, which doesn’t cause anyone to bat an eye in her native Spain. Plenty of research suggests that alcohol -- particularly when consumed to excess -- can do serious damage to a developing fetus, but individual rights are also at stake if the guidelines go in the other direction. But the research isn't always as clear cut as it's reported. The American Congress of Obstetricians and Gynecologists say no amount of alcohol is safe to consume while pregnant. Meanwhile, in the U.K., the Royal College of Obstetricians and Gynecologists say that "small amounts of alcohol during pregnancy have not been shown to be harmful." Ultimately, many studies say you should never drink while pregnant, and many others say a glass of wine isn't doing any harm. While the jury's out on that end, one thing's for sure: the manager at Hooter's probably isn't qualified to be making decisions for anyone.